The Pentagram: Does it symbolize witchcraft? When most Christians see a pentagram, their immediate reaction is "Witchcraft!" But is this really the truth? Let's take a look at the history of the pentagram. The truth just might surprise you. - A sign for royalty, symbolizing the spread of their power to the four corners of the world. - Called the "endless knot." It was a symbol of Truth. - The Hebrews also considered it a symbol of Truth, and for them it represented the five books of the Pentateuch (part of the Old Testament). - A sign painted on knights' shields, representing the five virtues: generosity, courtesy, chastity, chivalry and piety. The pentagram was actually one of the first Christian symbols, and represented the five wounds of Jesus. It was also thought to symbolize protection from demons. Prior to the time of the Inquisition, the pentagram was not associated with evil; instead, it symbolized Truth, spiritual experience, and the work of The Creator. 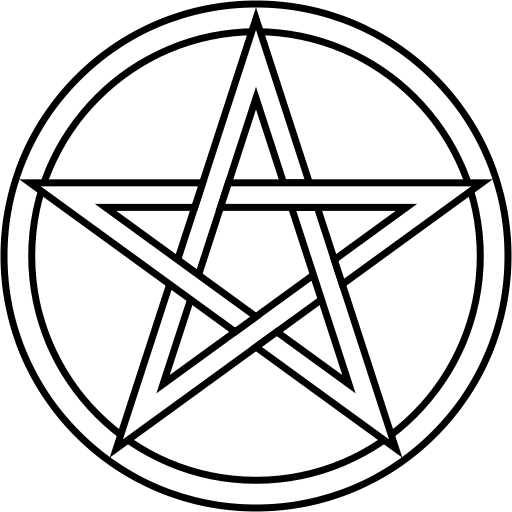 Over time the Catholic church removed the circle and altered the pentagram to a simple five-pointed star, presumably in reaction to the neo-pagans' use of the pentagram with the circle intact. During the Inquisition, The Catholic church lapsed into a long period of torture and murder. More people were killed for being labeled pagan or witch than died during the Holocaust. During this time, the pentagram was sometimes portrayed as a Goat's Head or the Devil. Around this time, poisoning as a means of murder came into prominence. Potent herbs and drugs brought back from the East during the Crusades had found their way into the cabinets of the healers, the wise, and the witches. Prominent deaths by poisoning caused the Dominicans of the Inquisition to move their attention from the Christian "heretics" to the pagan witches. In their attempt to destroy all witches, other horned gods such as Pan became equated with the Devil, and the pentagram, for the first time in history, was equated with evil and was labeled the "Witch's Foot". It's true that the pentagram is used as a prominent symbol in many various religions, including Wicca. However, this has always been the case. Today, in similar fashion, the rainbow is used as a symbol of homosexuality, but God gave us the rainbow as a reminder of His promise. We do not allow others to redefine what once did, and still does, represent something good. The rainbow still symbolizes Divine promise, and the pentagram still represents the protection brought to us by virtue and truth.